CLINICAL STRENGTH - AQUA Serum takes care your skin problem such as inflammation, swollenness, peeling, acne, dullness and wrinkles. It Improves skin texture and brightness with intense moisture and balance. 10% HYALURONIC ACID SERUM - We use the highest quality of HYALURONIC ACID, which hydrates skin to reduce the look of wrinkles in 4 weeks and delivers moisturizing ingredients 10 layers deep into the surface of the skin. 20% Vitamin C - Our serum provides high-density anti-oxidant, lightening-up skin, and getting rid of dullness. It is guaranteed to leave your skin radiant and more youthful looking by neutralizing free radicals & is proven to stimulate collagen & reduce fine lines and wrinkles. Patented technology - Our AQUA Patented Technology is guaranteed to make smaller-molecules easy to be absorbed without the greasy feeling. 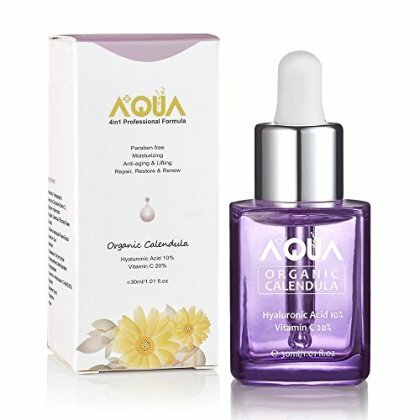 We also have EU ECOCERT organic certification for our AQUA serum, so feel SAFE when you purchase AQUA serum from us.